One of the most fascinating aspects of history is contemplating the "what if." In Venice's case the most thought provoking possibilities involve What if Venice hadn't been annexed by Santa Monica instead of Los Angeles. The residents, at least those who have read the town's history, realize that Los Angles annexed Venice to say it had a beach front, not for its profitable amusement park atmosphere. It didn't take them long to instill much of the blandness of the rest of its city by filling in most of its canals, closing its beloved amusement piers and eventually tearing down nearly all of its historic Venetian styled buildings. Certainly if annexation hadn't occurred at least one other amusement pier would have been built by Prior and Church at Leona Street which is presently the site of the Venice Fishing Pier and the foot of Washington Street. Since Venice's beginnings in 1905 there had been numerous proposed amusement pier and harbor projects that were never built. Many developer's boasted that they had strong financial backing or sold stock in their plans to the public. Some were even big investors who would suddenly lose interest. I guess the bottom line is that these projects that I have described below were never built. It is too bad. While some of them would have changed the character of the community, sometimes for the worse, others were quite interesting. Kinney planned to build a large hotel facing Ocean Front Walk on the north side of Windward Avenue. Originally the hotel was to be a smaller $50,000 three story hotel on a single lot. But Kinney, experiencing a cash flow problem and unable to fund all of his planned projects after the costly storm damage to his pier in 1905, decided to take on partners to finance the $200,000 five story hotel. David Evans, a local businessman, agreed to finance half the hotel. Kinney would purchase a quarter interest in the hotel and Dana Burks the remainder. The 100 x 170 foot hotel would contain 300 guest rooms, each with therapeutic hot salt tap-water. The hotel would feature, an elevator, a dining room on the top story and a rooftop garden. Once Kinney's Venice of America resort was up and running, he began flexing his financial muscle to rid himself of partners in various business ventures. Kinney's partners in his Venice Hotel project, particularly David Evans had become dissatisfied with the lack of progress after the hotel's foundations were completed and the contract for its structural steel let. Kinney, eager to be rid of his partners, gladly abandoned the project in November 1905 and repaid Evans. Of course, this didn't end Kinney's desire to build his hotel. In early January 1907 he held a meeting seeking a number of investors willing to invest $50,000 in his hotel. He offered to invest $50,000 in stock himself and furnish the site, foundations and pillars for an additional $95,000 in stock. The trouble was that nobody trusted him, especially since rumors abounded that Venice had been sold to the railroads. While Kinney never did build his hotel, he eventually used the site to build the Kinney Company offices. It was a single story arcaded building with a parking garage in the basement. It burned during the first night of the Zoot Suit Riots on May 8, 1943. Police suspected arson. Edward E. Harriman, the railroad tycoon who owned the Southern Pacific and the Los Angeles Pacific Electric, sent an open letter to the Los Angeles Examiner on December 11, 1906 that they planned to acquire Venice and make it a beach resort as vast and magnificent as Coney Island. The offer was practically an ultimatum since if Abbot Kinney declined they would built a rival resort in nearby Playa del Rey. Since Harriman owned the mass transportation system that enabled Los Angeles visitors to reach the Venice resort, they felt that Kinney would sell. Kinney and Harriman eventually reached a compromise. Kinney would retain control of Venice, while Harriman would have a free hand in developing the ocean front into a commercial port and harbor. Harriman planned to spend $785,000 to extend the breakwater to 3000 feet, then build their piers behind it to accommodate ocean steamers and freighters. Although it would cost him more than a million dollars, it would be the ideal link between his steamship line and his railroad. Although the Ocean Park Trustees opposed the project, Kinney made preliminary plans by applying to the War Department to build. Fortunately for Venice, its beautiful beaches were saved when Harriman lost interest and the plans for the harbor were abandoned. Eddie Maier, the local brewery owner announced plans in August 1912 to build a new amusement pier at Center Street, five blocks south of the Abbot Kinney Pier. While Maier and his contractor partner, Augustus Stuzer had announced their plans weeks before the Ocean Park Pier fire, it seemed even more viable with the lack of Ocean Park amusement competition. Maier's plans called for a concrete pier 1300 feet long, the outer 1000 feet to be 550 feet wide. The pier would contain a huge swimming plunge, a dance hall, a cafe in the shape of a sleek passenger liner, various rides and a children's Pavilion of Fun that would be free to children up to age twelve. There was to be parking for 700 automobiles at the base of the pier. Work began on the pier in November, but then abruptly stopped several weeks later. Rumors circulated that Maier suffered a business setback, while others speculated that he had bought Fraser's beach property in Ocean Park. Meanwhile Maier and his associates met in Los Angeles to adjust their differences. The delay was caused by a dispute between Maier and his contractor partner. Stuzer demanded a fee of twenty percent of the pier cost, and expected to be furnished with all building materials at no cost. Maier thought his demands were exorbitant and refused. Delays continued through the spring and summer until Maier withdrew from the company in the fall. The remaining stockholders didn't have the money to complete the project. The Steeplechase promoters decided to build their new horse racing ride on an extension of the Great Western Amusement Pier between Marine and Navy Streets. Their company was capitalized at $200,000. A steam hammer for driving the piles was engaged and lumber was ordered from the northwest in hopes of completing the project by the end of the year. But the huge ride was never built because the promoters were unable to sell enough stock in their company. Ed Dunnavant's newly incorporated Sunset Pier Company, which held the lease on the Center Street Pier, announced in late September 1920 that they were building a horseshoe pier. It would extend out 500 feet at Center Street, then make a 45 degree bend to connect with another pier to be build later at Mildred Avenue. On the south side of the pier would be a replica of an Ocean Liner with all the amusement features found on big passenger steam ships. It would have a swimming plunge, bowling alleys, restaurant and cabaret. They were negotiating with C.W. Parker, builder of the Steeple Chase ride, to build a duplicate on their pier. By taking advantage of the Kinney Company's misfortune when their pier burned in December 1920, they succeeded in issuing $700,000 in stock for their project. They promoted it as the only pier currently under construction in Venice, and one without competition. Nearby land values tripled. But the new pier was a disappointment when it opened the same time as the reconstructed Venice Amusement Pier in July 1921. The first stage of the pier was short and only featured the Sunset Ballroom and a restaurant. They never did complete their construction plans and eventually went bankrupt in the mid 1920's. It was announced on August 4, 1924 that the Sunset Pier was sold for $75,500 to the Electric Pier & Amusement Company. The new owners planned to build a new pier with a surface area of 20-1/2 acres, 6 acres larger than Coney Island's Luna Park. The new pier which would be built at a cost of $1,500,000 would contain the greatest outdoor swimming pool in the world; 600 feet long by 300 feet wide and have a depth ranging from 18 inches to 9 feet. It would have a wave making machine that could generate waves 3-1/2 feet high. A sand beach 75 feet wide would surround the pool which in its center would feature an enormous electric fountain. 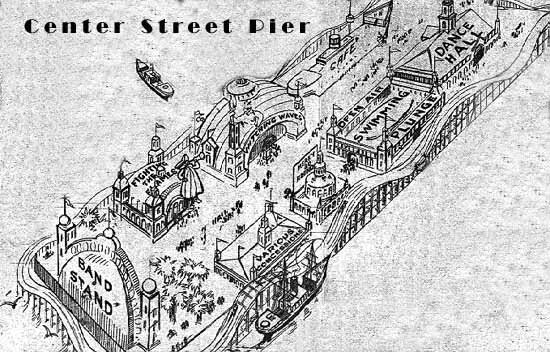 The pier's seaward end would feature a huge open air theater for 20,000 people and two aerial rides. The pier would also feature the finest rides obtainable for its amusement zone. Admission to the pier, which would accommodate 75,000 people, would be ten cents; rides of course would be extra. The contract for the Electric Pier was awarded in October. Work was scheduled to begin January 1, 1925 and a grand opening scheduled for June 15th. A model of the pier was displayed on March 25, 1925. The pier project was never mentioned after that. Either the company was not properly financed or they were wary of annexation efforts to Los Angeles. Prior and Church, amusement ride builders and designers, announced shortly after Venice's annexation election to Los Angeles, that they intended to build a $1.5 million fun zone at the foot of Leona Street (Washington Street) to be called Washington Pier. The 1200 foot long pier would have parking for 1500 automobiles. Attractions would include a bathing pool the size of the Plunge, a ballroom the size of the Bon Ton, a Giant Dipper coaster and a new Racing Bobs. It would be like the old Race Thru the Clouds roller coaster but instead of the cars running side by side, they would duck under one another and even lose sight of each other at times. But work on the proposed pier was held up because the City of Los Angeles intended to acquire all beach frontage including the pier leases. Venice's various civic organizations, especially the local branch of the Chamber of Commerce, supported the Kinney Company's plans to build a new business district on the old Villa City site near the Grand Canal. By March the new lagoon business district was nearly ready. Workers were pouring concrete for the streets and the Kinney Company announced that a $300,000 hotel would be build there. 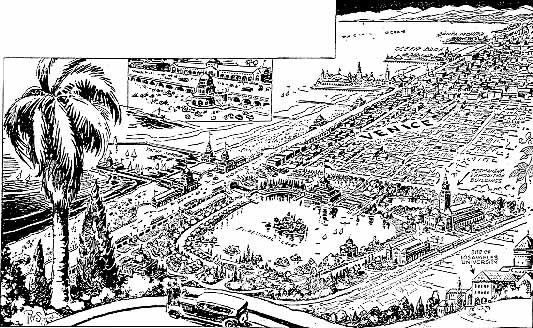 The adjacent canal district was filled in by the city of Los Angles in 1929 but no one began building in the new district. Venice's older business district along Windward. Loreli and Market Streets was certainly too small to accommodate the crowds at the popular resort. But once the Depression hit in the early 1930's, the area remained vacant for lack of investment funds. The Venice Chamber of Commerce presented the city of Los Angeles with a $10,000,000 grand plan for Venice's future that would make it more famous as a resort than Coney Island in New York. Plans called for the city to obtain all of the 3-1/2 miles of beach between Santa Monica and Playa del Rey (they already owned 2 miles). Then they would replace the present amusement piers with three huge jetties into the ocean. They would then built plazas on the land end of each jetty which would cost $1,000,000 each (plazas cost $300,000). Plans also included the construction of an elevated wooden boardwalk along the entire length of the beach. This structure, similar to Coney Island's, would cost $3,000,000. An huge artificial inland harbor as large as Lake Merrit in Oakland would be built at a cost of between $3,000,000 and $6,000,000. It would be used for bathing, yacht moorings, swimming and canoeing. They proposed to finance the project with a bond issue. They recommended that a special commission be set up to review their plans. Naturally they were pipe dreamers because the Los Angeles Parks and Recreation Department had no intention of building anything along the coast. If they had their way, all the amusement piers would be removed. In August 1934 the Halper-Robbins Corporation proposed to build a $3.5 million amusement project between Avenue 17 and Avenue 34. It would have a huge yacht harbor protected by a 1400-foot-long seawall, a 1500-foot-long concrete amusement pier, a ballroom and a 150-foot-tall observation tower. The owners were seeking financing from an Eastern backer. But L.A. Councilman Charles W. Breedlow was seeking political support for his own improvement plans for the beach area. He sought federal money to build a series of jetties, a seawall, breakwater, yacht club, aquarium and other facilities. He was dead set against a private corporation building what he thought the government could do better. With politics as it was, nothing was accomplished.